It is one of those questions that is periodically asked and never adequately answered. Like which came first: the chicken or the egg? And…why did the chicken cross the road? The hero question usually comes up as we lament the absence of heroes in our fast-moving, self-indulgent, high-technology, indifferent society. It often seems that we just don’t have any George Washingtons or Abe Lincolns running around, let alone A John Wayne or an Audie Murphy. But just when you think the night is darkest, up pops a hero from the counter at the Waffle House in Antioch, Tennessee (near Nashville). The hero is James Shaw, Jr. I don’t know him and don’t know much about him. According to news reports, he is a dad and an electrician. It doesn’t appear there is anything extraordinary about the guy. But when an evil man (who will not be named here) entered the restaurant and starting shooting people – four dead and many wounded – Shaw intervened, took away the shooter’s weapon and saved a crowd of people. Shaw has been praised by law enforcement officials and the people of the community. He has had his 15 minutes of fame, being interviewed on television and exhibiting nothing but humility and humanity. Not satisfied with saving a few lives, Shaw set up a gofundme page to help the victims of the shooting. He set a goal of $15,000 and soon had raised 10 times that amount. Heroes do stuff like that. Most of history’s heroes are people we have never heard of. They are simple, ordinary, people who do what has to be done when extraordinary needs arise. I don’t think they are either born or made – they just are. My guess is that a year from now there won’t be many people who remember the name of James Shaw, Jr. That doesn’t matter. The people he saved will remember. He will remember. Shaw, like other heroes, didn’t act for glory, attention, fame or fortune. He did what needed doing. That’s how heroes are. I suppose in the eyes of some that makes him a journalist. After all, he founded a newspaper and he writes. On another hand, a 12-year-old girl who keeps a diary (or journal) could be called a journalist. A real journalist is meticulous, accurate, takes clear notes or records conversations (with permission). If a real journalist reports on an interview they are careful to faithfully report what was said, in the context in which it was said. In Scalfari’s case, he fails on all these points. He doesn’t record or take notes, but simply engages in a conversation and then writes his impressions and calls it an interview. It is a little like having Picasso walk through a courtroom, do a cubist work from memory and call it court reporting. Perhaps I should give Scalfari a break in light of his advanced age: nearly 94. But I think he ought to know better and be more responsible. In his most recent interview with the Holy Father, Scalfari reported that the Pope had doubts about the existence of Hell. Despite how often the Pope has spoken of Hell and how it is a place to be avoided, social media went crazy and the Vatican had to issue an admonition not to trust what Scalfari writes. This is nothing new. It happens every time the Pope talks to this guy. So some people wonder why Francis doesn’t find someone a little more reliable to talk with. I don’t know for certain, but my guess is that the Pope is hoping to create a meaningful dialogue with the journalist – an adamant atheist – to come around to the faith before he kicks the bucket of printer’s ink and finds out Hell is real. Jesus dialogued with some rather sordid souls and saved a high percentage. Of course, none of them were reaching a large readership. 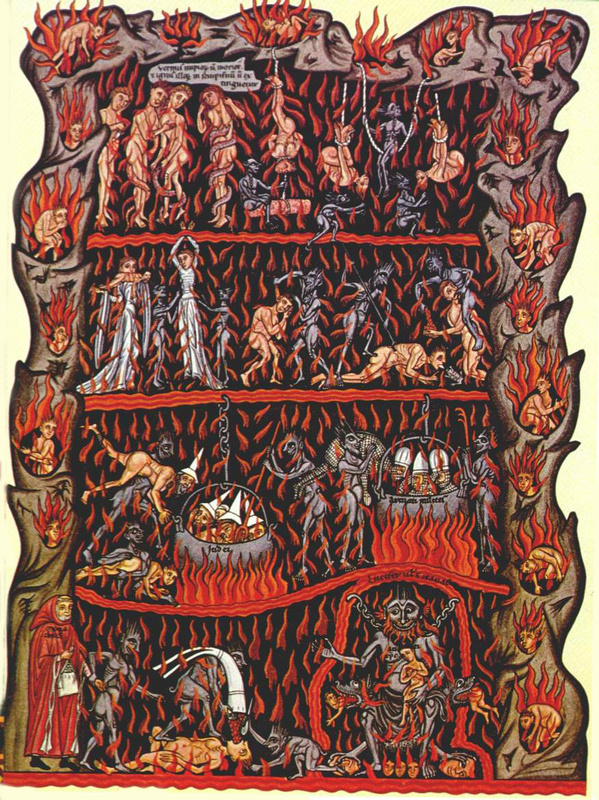 As for the existence of Hell, the Church says there is such a place and I agree. I’m sure many people – including noted theologians – could debate its nature. Dante wrote a bit about it. Artists have created countless images. I don’t believe the popular idea of it being a place where a guy with a pitchfork jumps around in red long underwear. But some people believe it is personally created to fit the individual sinner. If that is true – and with me being a frequent critic of the news media – I hope I don’t end up being interviewed for all eternity by Scalfari, with every word I speak being misquoted and presented out of context. And I dread he would be wearing red undies.